Because of safety precautions and limitations on the type of shooting allowed at nearly all public ranges, it can be very difficult to run many drills necessary to hone your defensive shooting skills, such as, drawing from the holster, reloading, shooting and moving, moving to cover, shooting at moving targets and shooting at multiple targets. We can at least dry fire some of these drills to practice footwork, reloads, and moving to cover. One critical self-defense drill that is extremely hard to practice live or dry fire is contact shooting. What is contact shooting, and why is it so important to understand how to do it? Firstly, contact shooting is using your firearm to engage a threat that is so close that the shot taken is against or within inches of the threat. There are several reasons why a contact shot may be necessary to stop a threat. If you are ambushed or caught off guard and the threat closes distance before you can react, you may be in a life threatening physical struggle with an armed attacker before you can draw your weapon. If you cannot create space, your best bet may be a close quarters contact shot to the central nervous system’s processing center or another vital organ. Imagine that you interrupt an aggravated, felonious assault of a family member inside your home. If the attacker is on top of your loved one, and the two are aggressively rolling or fighting, taking a shot at any distance at all, could result in you mistakenly shooting your loved one. In this scenario, a contact shot to the attacker's brain stem would likely be the quickest and safest way to stop the threat. What is so important to know about contact shooting? Because you are so close to the target, it may seem like there is nothing to consider other than pulling the trigger. On the contrary, there are major points that must be understood about making a contact shot. First of all, the type of gun you use matters. Think about how a semi-automatic pistol actually functions. The slide must cycle fully to the rear and fully forward to extract the spent casing, chamber the next round and ready the striker or hammer. The slide must be all the way forward or ‘in full battery’ in order for the action to function. 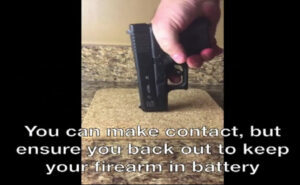 When making a contact shot, if the gun is pressed firmly against the attacker’s body, it can cause the slide to move very slightly to the rear, and possibly take the gun out of battery. If the gun is out of battery, pulling the trigger will not fire the cartridge. Obviously, a revolver does not have this same issue because of its design. But this is a very important point to understand and recognize, so if the need to take a contact shot with your semi-automatic pistol arises, you know that even if you drive the gun into the threat’s body, you must back off even if it is just an inch, to allow the slide to go back forward into full battery. Another consideration is not dependent on the type of firearm: contact shooting will almost always be done in a compressed position, i.e., with the firearm extremely close to the shooter’s body and not extended at arm’s distance. If you have never shot from a compressed position it can be a very strange experience. Additionally, contact shooting is inherently a very dirty job. Be prepared for the possibility of becoming very intimate with the attacker’s body fluids. I know that most people believe that when the time comes they will respond correctly and not hesitate. However, being prepared and at least having gone through some drills in dry fire will give your brain a ‘like-scenario’ to default to in a high-stress situation, and lessen the chance of making an error. As always, train, and stay safe! Purchase an extended barrel (threaded if you like for a suppressor). With the extended barrel, you will be less likely to take the semi auto out of battery during a contact shot. Hi Steve, Great point, that would be an easy way to reduce the chance that it comes out of battery. Also, have you seen that the new Honor Guard handgun has a version with an extended frame? Kinda a neat design, that would eliminate this possibility. Thanks for the great feedback!! !